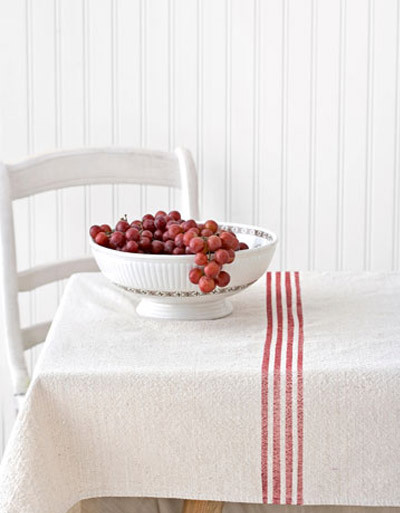 Step 1: Wash and tumble dry a natural-colored canvas tablecloth a few times to soften the fabric. Step 2: Lay the cloth flat. Run 5 strips of grout tape down the middle of the fabric widthwise, 0.6cm apart. Step 3: Paint red fabric paint onto a paper plate and dab a brush in it, off-loading any extra paint onto a paper towel. Working in short strokes, lightly brush the paint on the cloth between the taped areas to catch the grain of the canvas.